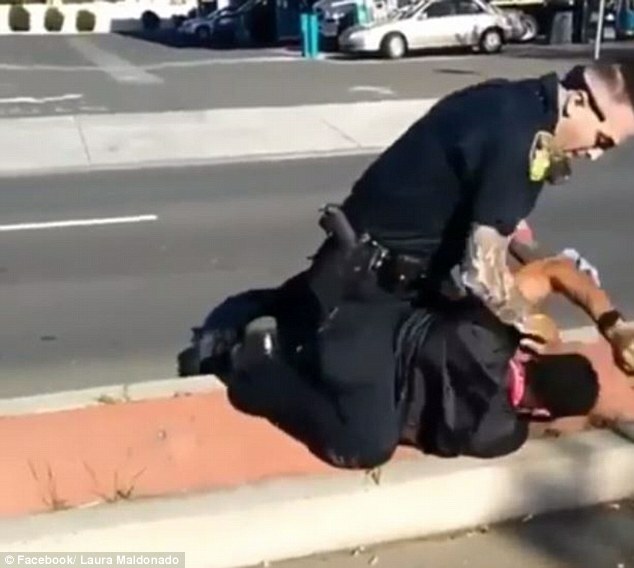 A shocking police takedown in California that was caught on camera has witnesses criticizing the officer for the handling of the situation, as some say he went too far with his usage of excessive force and profanity. Witnesses claimed the first officer who arrived on scene chased the suspect, who was unarmed, for several minutes until the man gave up and sat down in the middle of the road. The police officer then allegedly pushed the man to the ground before trying to place him in handcuffs as the suspect appeared to struggle, witnesses said. 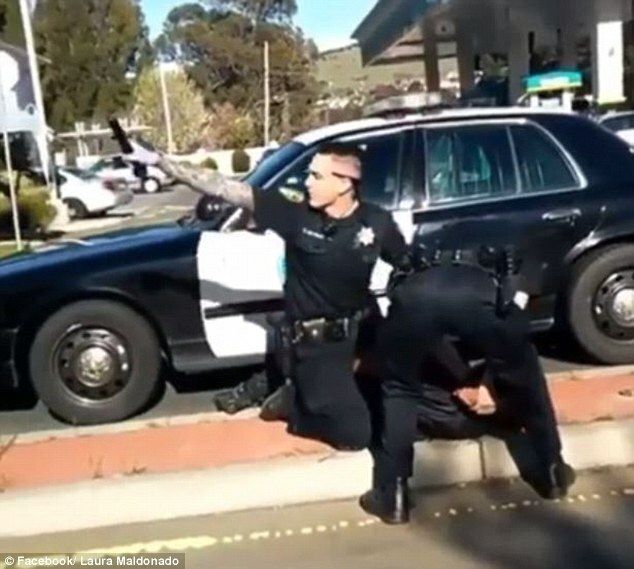 The incident occurred on Friday afternoon in Vallejo at a Vallero gas station when police responded to a 911 call where someone claimed a man was acting ‘crazy’. The officer chases the suspect into the street before he tries to arrest him. ‘The kid surrendered,’ one witness, who declined give his name, told KPIX. Vallejo police said Internal Affairs is reviewing the video to investigate the officer’s use of profanity and the aspects of the arrest. In a statement sent from Lieutenant Jeff Bassett from Vallejo PD said: ‘ … Just like anyone else officers are innocent until proven guilty. ‘Violence is always ugly but police officers are exposed to violent situations everyday and they are required to over come that violence not just match it. The suspect is in jail facing charges of being under the influence and resisting arrest. The name of the officer has not been released.